I have been capturing the likenesses of peoples pets all over the country since 1988. I hold a Bachelor of Science degree in Art Education and have studied and taught many different types of media. John Lennon once said, "Life is what happeneds when you are making other plans". While I have always been an artist and loved animals I found my niche by accident. I was busy designing clothing and incorporating animal themes when asked if I could hand paint someone's pet on a sweatshirt. Never having done that, I was eager to the challenge so I said yes. That was the beginning of thousands of keepsakes and smiles for animal lovers. I love bringing joy to those who love their pets with my artwork. 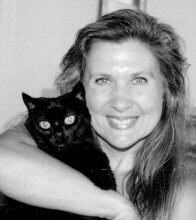 Each one of my pets has left a paw print on my heart forever so I understand how special your pets can be to you. When I look into the eyes of your pets from the photos y ou send, your pets leave paw prints on my heart as well. I never forget them and I always enjoy hearing your stories about them. Former President George Bush's Millie, Former President Bill Clinton's Buddy and co-anchor of CBS This Morning's Gayle King's dogs and a few other news anchors pets are among the most memorable pets that I have painted. Let me paint a personalized item of your beloved best friend that you can cherish or give as a unique gift.